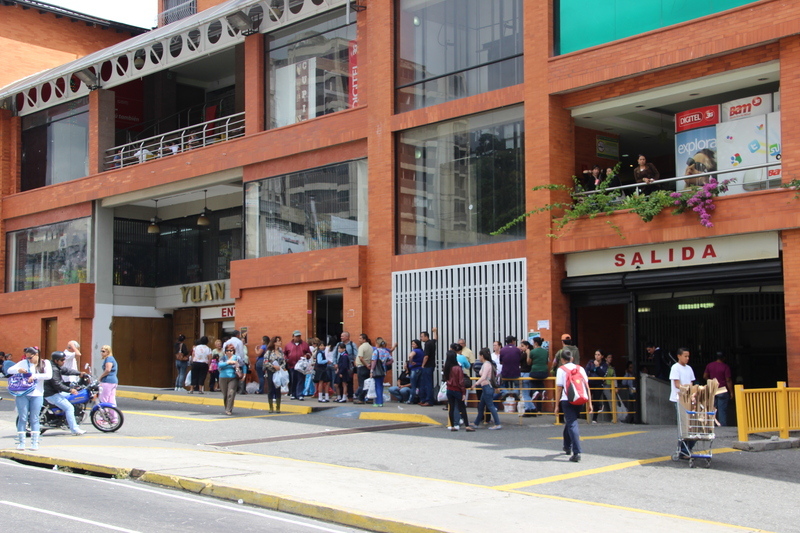 A line outside Yuan Lin, one of Merida’s larger supermarkets. Nobody seemed to know why they were in line. “Is there milk?” I asked one man. He said he didn’t know, but said he was hoping there might be some cornflour or cooking oil. “But, you don’t know why there is a line?” I asked. He shook his head. There were at least 150 people in the queue, and this particular man was perhaps half an hour away from entering the store. Here in Merida, the queues have become a daily affair in recent weeks, especially in the mornings. On the way to work I usually pass one. Sometimes the queues are short – just a dozen people placidly lined up outside a supermarket. Lately, however, they have been long. The lines themselves aren’t exactly new; it’s the regularity that’s unusual. Throughout 2013 scarcity of various products flared and faded, and queues materialised every so often when rare products went on sale. For example, when I arrived in Venezuela last February sugar had been scarce for months. When sugar first began to reappear, lines would spontaneously manifest outside supermarkets as word of a delivery of the sweet stuff washed through the streets like a glucose rush through arteries. One student I met began hoarding sugar, fearing it would disappear as soon as it came. He piled dozens of sacks of sugar in his kitchen as if he was on a manic sugar high. Once he had what appeared to be a year’s worth of sugar, he began musing with the idea of a road trip to Colombia to stock up on milk; which was also becoming scarce. Like every glucose rush, the shortages soon receded, and I can only guess that the horde of sugar started collecting cobwebs beneath the kitchen sink. The queues dwindled as availability stabilised, and panic buyers opted to stay at home. However, with the new year the scarcity is back with a vengeance. It’s not just sugar, but cornflour, cooking oil, milk, toilet paper, wheat flour, margarine, mayonnaise, pasta and rice that are subject to price regulations and cleaning products like soap. None of these products are completely unavailable; they just come and go from supermarket shelves. One day there might be toilet paper, but no margarine. The next day margarine may arrive, but it’ll evaporate from shelves by midday as people panic buy. Of course, the black market is always flush with bootleg goods – though at vastly inflated prices. As the availability of so many products fluctuates, the mentality driving the queues is changing. People who once queued for an hour to buy a specific product are now lining up from early morning for no obvious reason. I first encountered this wishful waiting while passing by a semi-permanent line outside one of the larger supermarkets in Merida, Yuan Lin. “I hope they have milk,” one woman told me wistfully a few weeks ago while she was waiting outside for nothing in particular. She had no reason to believe there would be any milk – it’s one of the rarest products. But maybe, just maybe if she stayed there all day she could get lucky. Just maybe. A few hours before writing this I ran into yet another queue. Between 70 to 80 people were lined up outside a neighbourhood supermarket a few minutes away from my house. The supermarket’s wide entrance had been almost entirely closed, with just a small slit between the sliding doors wide enough for one person to slip through. An elderly woman at the front of the queue told me there was a sugar delivery due. Sure enough, moments later a truck laden with sugar pulled up outside the supermarket. Across the road another store was selling bricks of unrefined sugar, which is often used in Venezuela instead of the refined stuff. The only real difference is a slight caramel tang. Yet today the bricks were ignored by everyone except a few entrepreneurial bees. Even the shopkeeper looked like he resented the dull brown blocks, and gazed vacant-eyed across the street at the glistening bags of pure white, refined sugar. It’s not just sugar people line up for either. A few weeks ago the bodegas (small corner shops) in my hillside barrio were besieged. Someone had spied a truckload of cornflour unload at all the bodegas. Before the truck had even navigated out of the barrio’s haphazard streets, my neighbours had already formed neat little queues outside each closet-sized store. Everyone was grinning and laughing as they lugged bags of cornflour home. For working class Venezuelans (like most of my neighbours), lining up to buy cornflour makes sense. It’s a cheap staple that most families rely on, especially the poor. However, last week crowds gathered yet again outside Yuan Lin merely to buy mayonnaise. Restrictions were put on how many jars individuals could purchase, so entire families turned up to maximise the amount of mayonnaise they could shovel past the cashier. If I didn’t know that Venezuelan households tend to just have showers, I’d suspect some people were planning on bathing in mayonnaise. Unfortunately, whether it’s a basic staple, a superfluous condiment or nothing at all, the lines are omnipresent. As I write there are lines outside shops stocking soap in downtown Merida. They’re like engorged snakes basking on the pavement in the tropical heat. Slowly easing their way into the shade of the stores. It’s important to note that not everyone is in a queue. For each person in line, a dozen others walk by. Nonetheless, enough people are lured into the queues to ensure even the passer-bys are subjected to the silent broadcast. The lines are alive and sentient, and they can speak. They whisper like the snake in the garden. They tell everyone that they should feel insecure. They scream that our collective anxiety can be soothed by another spare roll of toilet paper just in case, or that extra jar of mayonnaise just in case. Buy as much as you can today, just in case. Wait as long as you can for now, just in case. A fortnight ago I was speaking to people in yet another supermarket queue. “There isn’t a scarcity of cornflour,” one woman told me when I asked how she felt about the shortages. She was physically trembling, and looked like she was trying hard to maintain self control, carefully forming each word and keeping her tone neutral. “There’s a scarcity of morals,” was her final comprehensible statement. From that point, she lost it. She started yelling and flailing her arms as though the bees from the sugar bricks were swarming her. My Spanish isn’t great, so when she started screeching I couldn’t understand much. I’m now trying to avoid the queues now. They’re depressing because they give the impression that the scarcity and sabotage is going uncontested. They’re billboards advertising submission to the economic war against Venezuela. The hissing of those snakes drowns out the call to revolution. Merida’s Chavistas packed into the city square to mourn Chavez’s death last year. They flooded the city centre to demand the revolution continue when Maduro visited in April. The left rallied nationwide to support mayoral candidates in the December elections, despite the poor stock in municipalities like my own. How many of those same people are now lining up all day dreaming of mayonnaise and margarine, instead of revolution and socialism? I don’t know, but I hope not many. Meanwhile, the right is idle until the fingers of their puppet masters in Washington twitch. For now the puppets dangle limp, because this is a war of attrition.